Bird mating season has returned to Boise. In the Hull's Grove area just North of downtown, and near our house, a number of birds converge each year to reproduce. 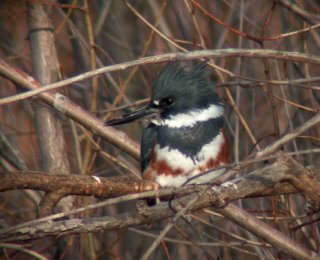 Last year the Great Horned Owls raised 3 chicks, the Redtail Hawks raised three chicks, two mating pairs of Belted Kingfishers raised an unknown number of chicks, a pair of Coots raised 7 chicks, and lots of ducks. We also saw a Pied-billed Grebe and a Northern Harrier looking for mates, but do not believe that they were successful, at least in this area. Well the Owls are back, a Harrier is common in the area, the Redtails are on the nest, and the kingfishers are chattering away. 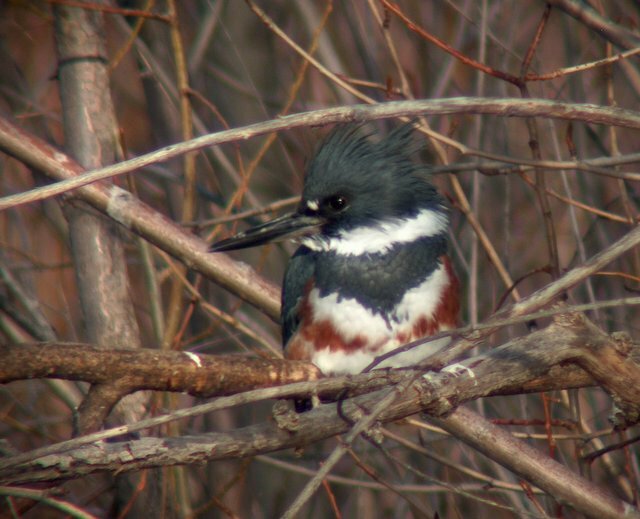 Here is a recent photo of a female Belted Kingfisher perched above the lower Hull's Grove pond. Photo taken with an HP PhotoSmart 945 digital Camera through a Swarovski spotting scope using a Scopetronix digiscope adapter.